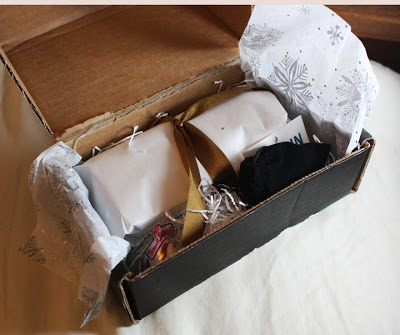 My last Julep Maven box of the year! For this box I went for the It Girl style. It included three polishes; Vivien, Ivy and Harper. I added the instant warming foot scrub as an add on so I didn't miss out on this months product. The box is filled at the base with a snowflake tissue paper to wrap the whole thing, glittery paper shreds and then all my goodies for the month! 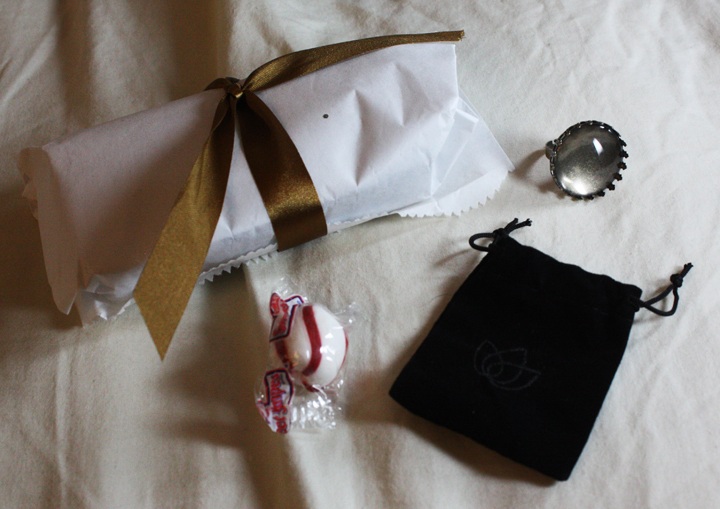 My polishes were wrapped in a white baggie with a golden ribbon, I got a wintergreen flavored pillow mint and the extra this month is a DIY cabochon ring! I'm very exited for the ring but beating myself up over what color to paint on it! My polishes arrived safe and sound and full of glitter! Vivien, Ivy and Harper in that order. I went for Vivien first. Vivien is described as a full coverage multi-dimensional gold glitter. The gold shimmers were nice and the large champagne hexes do bring to mind a bubbly drink. I wasn't too much of a fan of this polish though. For a 'full coverage' glitter this took three coats and my visible nail line is still there. I think it may look nice layered over other colors though. This bottle shot of Vivien shows those great shimmers. You can really see that this isn't really much of a full coverage glitter in the macro shot here. 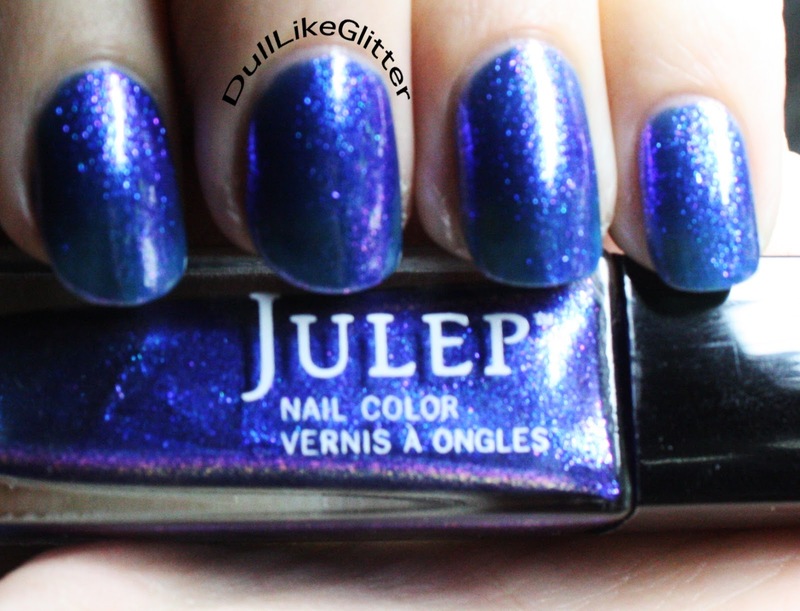 Julep Ivy is a beautiful sapphire blue. 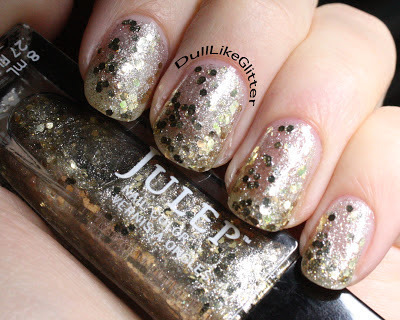 Julep calls it a micro glitter metallic. The glitters in this are almost flaky and catch the light at angles to reflect a violet back to you. The color shift is very nice! Again this was three coats and you can still slightly see through it. I think I would prefer it over a dark blue base color. I really liked this polish! This bottle shot of Ivy more accurately shows the flakey glitters and gorgeous color shifting. This macro more accurately shows the sapphire blue straight out of the bottle. 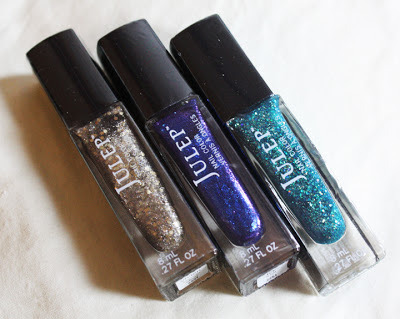 Julep Harper is a full-coverage, opalescent, mermaid blue, multi-dimensional glitter. It is a wower! It has a teal jelly base with all kinds of beautiful light catching glitters packed in. The base was a little thick to hold all the glitters in so it spread a little sticky but it is worth it for all the beautiful colors. To make the glitters really stand out I could see this over a dark color anywhere from blue to black. It is gorgeous on its own as well! Ooooh, this bottle shot makes me drool a little. 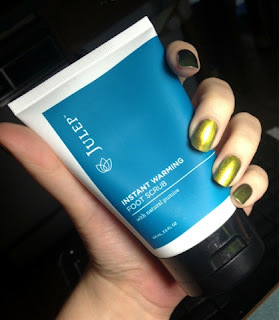 I was amazed with the Julep instant warming foot scrub. It is so sensational! Hits Trendy from the Mari Moon Collection on my nails. This is a cucumber mint scented scrub that warms up on contact and is packed with natural pumice to exfoliate, chili pepper oil to stimulate circulation and vitamin E to nourish. Upon applying to my soles it was very gritty and fully of pumice, great for bottom of the feet! As soon as you start rubbing the scrub around it instantly warms pretty intensely for about five seconds. The warming sensation is wonderfully cozy. After that it fades and you can get down to the nitty gritty pumice for scrubbing your feet smooth. Julep products never let me down. Overall I am very pleased with the box! I loved Harper and Ivy but wasn't too thrilled with Vivien. I'll probably swap it or add it to a giveaway. The foot scrub is fantastic! It claims to give you softer soles in 2 to 3 uses, which I am looking forward to. To try out your own Julep Maven subscription just click here and take the Julep style quiz! They will match you to one of five styles that fits you best. Each month they will send you a box of polish, extras and products for $19.99. BUT to try your first box for only 1 cent use the code JULEPVIP when you checkout your maven subscription. If you don't like it you can always cancel afterwards and keep your 1 cent box. It's a great deal! Harper is really pretty! Ivy looks alot like Pure Ice Getting Gorgeous. Harper was my favorite of the box! Very versatile and stunning alone. honestly, I'm glad I skipped out on this. The only thing I love in this box is the diy ring. I was really lusting after Harper, but it's eh for me. Better to save my money for the after christmas sales! I was excited when I saw the the polishes on Julep but it was a bit of a let down that none of these were really full coverage. Thats ok for me though I'll still use Ivy and definitely Harper. I agree the ring is super cute. I'm happy about that part! That's definitely the way to go! That green is amazing! And thank-you for my first Juleps! I love them! You're welcome! I'm so glad they got their safe. Hopefully I can send you more someday! I like Harper as well it's definitely my favorite. I am so jealous, I wish Julep shipped internationally because these polishes are all AMAZING. I think Vivien looks goooorgeous! And that is SO awesome that you got a DIY polish ring with the box! I layered Harper over Zoya Frida, it's such a gorgeous color! Awww....I wish I have these nail polishes. Love their colors for they are perfect this holiday season. I better include these nail colors to my wishlist.